The Best of Teacher Entrepreneurs III: FREE MATH LESSON - "Multiplication Strategies"
Are you looking for some fun ways to present the various multiplication strategies such as using arrays, number lines, groups, and repeated addition? Why not try download my FREEBIE! In this FREE lesson, you will get one complete lesson from my Multiplication and Division Unit where it is structured in the workshop model and comes with everything you need to teach this lesson! It starts with a warm up activity, a mini-lesson that is scripted for you in case you are not familiar with the workshop language, the activities to complete the guided practice and independent activity, and a closing activity. This helps you meet the Common Core Standards of 3.OA.7 and 3.OA.1! Soaring Strategies With A Hot Air Balloon! Create a 4 Door Foldable! 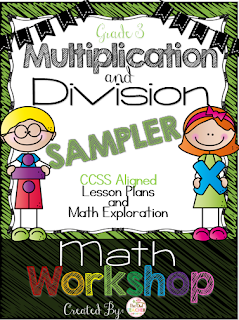 Click on the picture of the Sampler Cover above to download the FREE MATH LESSON multiplication strategies! And check out the full complete Math Workshop Units (and all the others!) at my Teachers Pay Teachers Store! And don't forget to follow me for more freebies, tips, and other fantastic ideas!